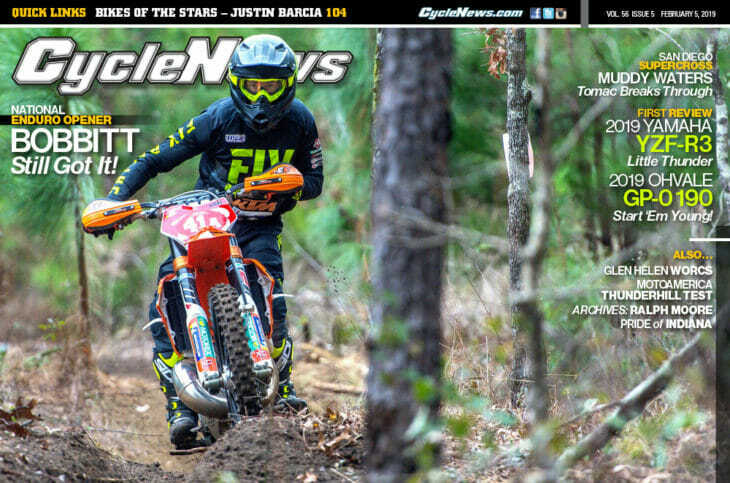 In this week’s issue of Cycle New Magazine #5, you’ll find our coverage of the Sumter National Enduro in South Carolina, which marked the opening round of the 2019 Kenda AMA National Enduro Series. We also have full coverage of the San Diego Supercross from Petco Park. Yamaha also introduced its update 2019 YZF-R3 and we took it for a spin. We also reviewed the Ohvale GP- 190 road racer meant for the kids. And, as always, we get you caught up with all of the latest motorcycling news from around the world. It’s all right here, it’s free and just a click away. Click here for Cycle News Magazine #5, 2019.